Na Na Ping was born in 1952 at the Pascua Yaqui village of Guadalupe just out side of Tempe Arizona where he remains a registered member. After receiving a business degree from Arizona State university,inspired by his uncles lapidary work, he began his career in jewelry. 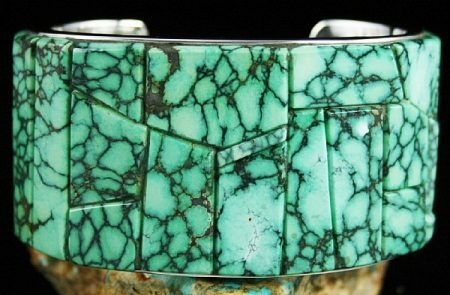 Developing his skills over time, he began experimenting with cutting edge inlay using a wide range of semi precious stones such as turquoise, varascite, sugilite, jade and many others. His fame developed from his unusual ability to combine many complex cuts into a mosaic of color onto a wide and heavy sterling silver shank. This mosaic extends to the edge of the piece of jewelry, giving it a feel of floating atop without the sterling silver appearing in the field of the piece, much like you feel on the edge of an infinity pool. After meeting his wife, a Nambe pueblo woman, her grandfather in a ceremony gave him the name Na Na Ping, the Tewa word meaning Aspen Mountain. Today, Na Na Ping teaches jewelry design at the Poeh arts school in Pojaque Pueblo north of Santa Fe, New Mexico. He is the past president of the Indian Arts and Crafts Association based in Albuquerque, New Mexico and has served as Vice President of the prestigious Southwestern Association for Indian Arts. He is the recipient of the SWAIA Arlene Feddes fellowship award that recognizes excellence in Native American Art. He has won first prizes for jewelry in every major show throughout the southwest as well as internationally in Japan, Germany and Australia. His pieces are shown at major museums, among them, the National Museum of the American Indian in Washington DC and New York, Museum of Northern Arizona, Heard Museum, Indian Pueblo Cultural Center and the Eiteljorg Museum of Germany. Peacock is a varascite, calcacitirite with turquoise traces that is hard to classify, found in north central Nevada. It was a hat mine that produced a small amount of fine spiderweb material. 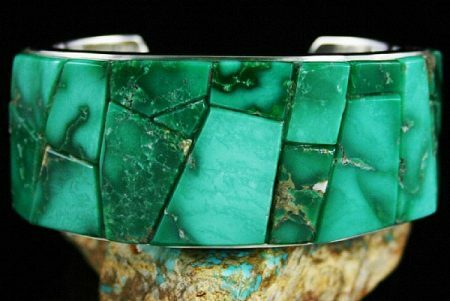 Pascua Yaqui master jeweler Michael Garcia (Na Na Ping) has taken this lovely gem, found in a small collection, and produced this wide spectacular bracelet. Famous for his lapidary skills, he has cut dozens of pieces and elaborately placed them together to create this stunning and distinctive look. Over 1700 carats were used in this creation, all from a single large nugget. They are set raised in a wide channel so that only the gems show, not the sterling. The gems flow to the edge in a seamless fashion. He finishes the bracelet with a heavy gauge of sterling silver that matches the impressive width. 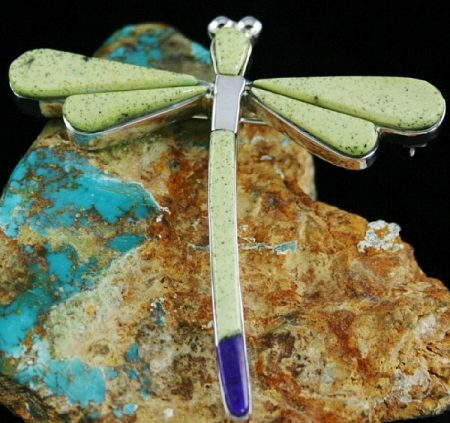 Na Na Ping has created this marvelous yellow and purple dragonfly out of rare Orville Jack turquoise and sugilite. The yellow hue of the Orville Jack is complimented with tiny brown spots mimicking the natural look of the fly. The dark purple sugilite finishes the touch of the piece in a magical way. Na Na Pings most collectible pieces are his masterpiece wide inlaid cuffs. He is able to cut and inlay dozens of stones with amazing precision from side to side virtually the entire length of the shank. The stones are raised for effect and precisely polished for their beauty. Over 1500 carats of gem grade Broken Arrow varascite from Nevada went into the creation of this amazing piece. The gems are a deep apple green with just enough variation in shade to enhance the beauty. This grade of Broken Arrow is rare as a single cabochon. It is amazing, however, to find dozens of cabochons in one bracelet. Not only is the lapidary work superb, but the heavy gauge silver of the shank is also a thing of beauty. Na Na Ping creates wonderful dragonfly pins. His latest is made of high grade natural Morenci turquoise inlaid precisely on the body and wings with a sugilite tail for effect. His pins are fun and whimsical, yet highly collectible. This piece can be worn as a pendant as well. 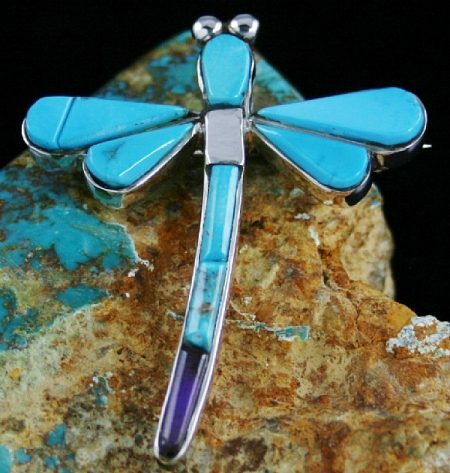 Pascua Yaqui jeweler Na Na Ping is known for his fine lapidary skills and his use of the dragonfly in his designs. This beautiful bracelet is created by splitting a heavy gauge sheet of sterling silver into a shank and bending it to perfection. A dragonfly is created and inlaid with gem quality natural sugulite from Africa and gem grade natural yellow Orville Jack turquoise from Nevada. The finished bracelet is unique and vibrant. 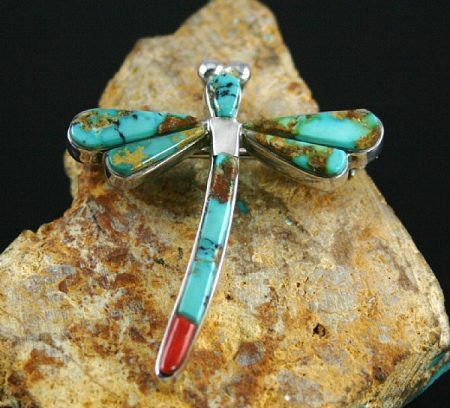 Pascua Yaqui jeweler Michael Garcia (Na Na Ping), has created this lovely one of a kind dragonfly pin/pendant by setting the piece with both high grade natural Royston turquoise from Nevada and Mediterranean coral. The turquoise contains vibrant color combinations of blue-green with golden-reddish-brown matrix set off with the coral at the tip of the tail. The artist created the eyes with large sterling droplets and the bail swivels up to be worn as a pendant or down as a pin. 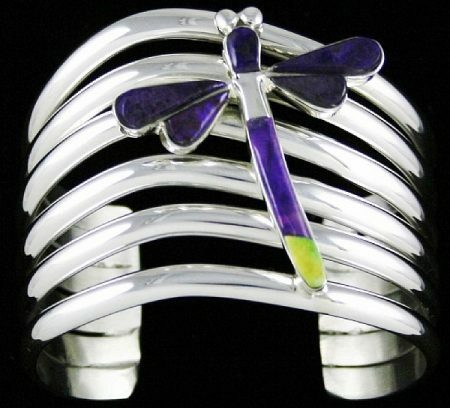 This whimsical piece would be a great addition to your dragonfly collection.